Witness Liverpool in action in the Premier League, UEFA Champions League, FA Cup and League Cup at Anfield with an outstanding day of entertainment courtesy of official Liverpool hospitality packages including VIP tickets this season. Liverpool Football Club is adored by fans around the world that connect with the history of Anfield and the special moments that the club has been involved with over the decades. European Cups, League trophies and FA Cups adorn the trophy room at Anfield, serving as a permanent reminder of the unwavering ambition of one of English football’s leading lights. Manager Jurgen Klopp has ushered in a new era at Liverpool and assembled an exciting, young, talented squad who have risen to the challenge and showed their phenomenal potential of being one of the best sides in the world by reaching the UEFA Champions League Final last season. Step into the history of this famous club and experience a match day like no other at Anfield this season as their enigmatic, exciting team, featuring the likes of Mo Salah, Sadio Mane, Roberto Firmino & co. face the biggest teams in the Premier League and across Europe in the 2018/19 season. Match day hospitality grants privileged football fans access to the exclusive hospitality restaurants and VIP boxes inside this world famous footballing theatre, complete with Liverpool VIP tickets for each fixture this season. Invite your group of guests to enjoy official Liverpool hospitality packages at Anfield and experience The Kop in full voice with unforgettable entertainment. Explore the full range of match day VIP experiences and Anfield hospitality tickets available at Liverpool Football Club and enjoy Liverpool hospitality at any domestic or European fixture this season. Official off-site Liverpool hospitality in The Sandon – the iconic birthplace of Liverpool Football Club – less than half a mile from Anfield is a famously popular place to entertain guests on match day. This atmospheric sports bar style lounge area at Anfield is a fantastic way to enjoy a visit to Liverpool Football Club for a home match, offering guests a host of great food options and VIP tickets. Soak up the pre-match atmosphere within the hugely popular Anfield Code Lounge and enjoy a relaxed informal day of entertainment, complete with official Liverpool VIP tickets to enjoy the action. 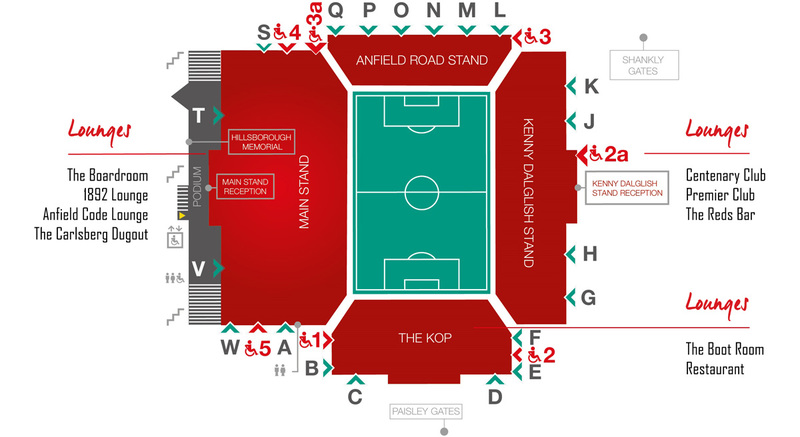 Liverpool hospitality tickets for The Reds Bar situated within the Sir Kenny Dalglish Stand gives fans the opportunity to enjoy a fantastic VIP experience in the heart of the iconic Anfield stadium. Experience great Liverpool hospitality at Anfield including a visit to the LFC museum, meet Liverpool legends and enjoy three course dining before taking up your seats to enjoy watching the big match. Enhance your visit to Anfield with a memorable Liverpool hospitality experience in the Premier Club, comprising delicious food, half time refreshments and premium VIP tickets overlooking the Anfield turf. Savour an exceptional match day at the Centenary Club, named in honour of LFC legends Bill Shankly and Bob Paisley, with superb Liverpool hospitality with 4 course dining, entertainment and VIP tickets. Celebrating the birth date of Liverpool Football Club, the 1892 Lounge creates a winning match day VIP experience with fine dining, complimentary drinks and VIP seats in the Directors’ Box at Anfield. Inside the various hospitality areas at Liverpool Football Club, the dress code is smart casual. Home supporters jerseys, smart jeans and smart trainers are permitted for hospitality guests, however tracksuits and ripped denim is not allowed. We advise guests to bring warm clothing and a waterproof jacket depending on the forecast, as the weather in Liverpool can be changeable. We look forward to welcoming you to Anfield.